There are many instruments on an aircraft that indicate the mechanical motion of a component, or even the aircraft itself. Some utilize the synchro remote-sensing and indicating systems. Other means for capturing and displaying mechanical movement information are also used. This page discusses some unique mechanical motion indicators and groups instruments by function. All give valuable feedback to the pilot on the condition of the aircraft in flight. The tachometer, or tach, is an instrument that indicates the speed of the crankshaft of a reciprocating engine. It can be a direct- or remote-indicating instrument, the dial of which is calibrated to indicate revolutions per minutes (rpm). On reciprocating engines, the tach is used to monitor engine power and to ensure the engine is operated within certified limits. A tachometer for a reciprocating engine is calibrated in rpm. 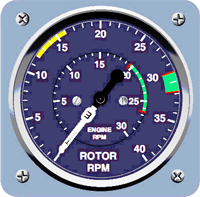 A tachometer for a turbine engine is calculated in percent of rpm. 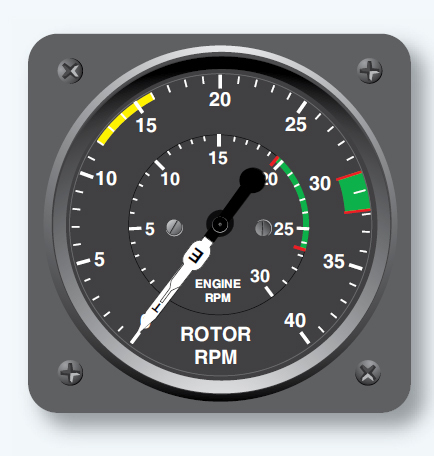 In addition to the engine tachometer, helicopters use a tachometer to indicator main rotor shaft rpm. It should also be noted that many reciprocating-engine tachometers also have built-in numeric drums that are geared to the rotational mechanism inside. These are hour meters that keep track of the time the engine is operated. There are two types of tachometer system in wide use today: mechanical and electrical. It is not practical to use a mechanical linkage between the engine and the rpm indicator on aircraft with engines not mounted in the fuselage just forward of the instrument panel. Greater accuracy with lower maintenance is achieved through the use of electric tachometers. A wide variety of electric tachometer systems can be employed, so manufacturer’s instructions should be consulted for details of each specific tachometer system. A popular electric tachometer system makes use of a small AC generator mounted to a reciprocating engine’s gear case or the accessory drive section of a turbine engine. As the engine turns, so does the generator. The frequency output of the generator is directly proportional to the speed of the engine. It is connected via wires to a synchronous motor in the indicator that mirrors this output. 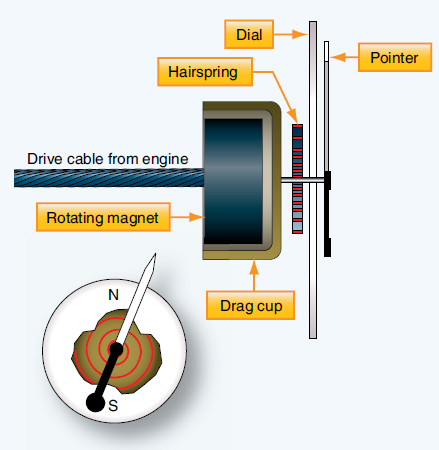 A drag cup, or drag disk link, is used to drive the indicator as in a mechanical tachometer. [Figure 4] Two different types of generator units, distinguished by their type of mounting system, are shown in Figure 5. 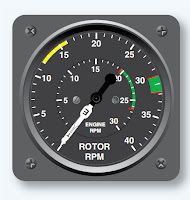 Some turbine engines use tachometer probes for rpm indication, rather than a tach generator system. They provide a great advantage in that there are no moving parts. 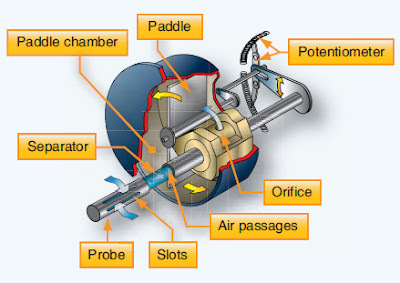 They are sealed units that are mounted on a flange and protrude into the compressor section of the engine. A magnetic field is set up inside the probe that extends through pole pieces and out the end of the probe. 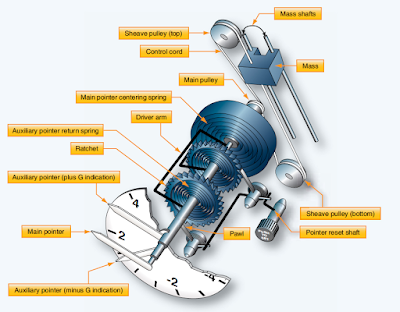 A rotating gear wheel, which moves at the same speed as the engine compressor shaft, alters the magnetic field flux density as it moves past the pole pieces at close proximity. This generates voltage signals in coils inside the probe. The amplitude of the EMF signals vary directly with the speed of the engine. 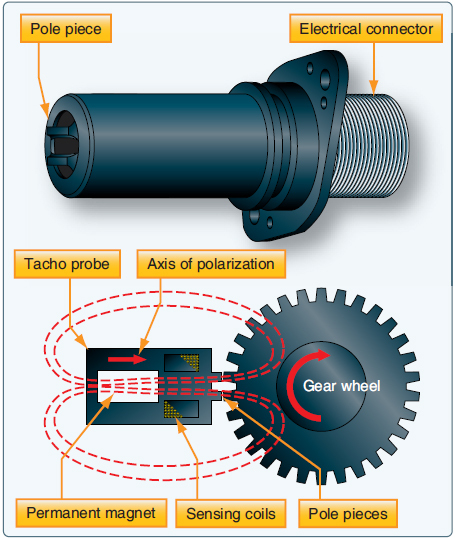 A tacho probe has no moving parts. The rate of magnetic flux field density change is directly related to engine speed. The synchroscope is an instrument that indicates whether two or more rotating devices, such as engines, are synchronized. Since synchroscopes compare rpm, they utilize the output from tachometer generators. The instrument consists of a small electric motor that receives electrical current from the generators of both engines. Current from the faster running engine controls the direction in which the synchroscope motor rotates. If both engines are operating at exactly the same speed, the synchroscope motor does not operate. If one engine operates faster that the other, its tach generator signal causes the synchroscope motor to turn in a given direction. Should the speed of the other engine then become greater than that of the first engine, the signal from its tach generator causes the synchroscope motor to reverse itself and turn in the opposite direction. The pilot makes adjustments to steady the pointer so it does not move. One use of synchroscope involve designating one of the engines as a master engine. The rpm of the other engine(s) is always compared to the rpm of this master engine. 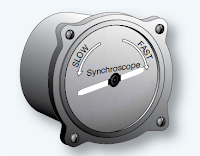 The dial face of the synchroscope indicator looks like Figure 8. “Slow” and “fast” represent the other engine’s rpm relative to the master engine, and the pilot makes adjustments accordingly. An accelerometer is an instrument that measures acceleration. It is used to monitor the forces acting upon an airframe. Accelerometers are also used in inertial reference navigation systems. The installation of accelerometers is usually limited to high-performance and aerobatic aircraft. Simple accelerometers are mechanical, direct-reading instruments calibrated to indicate force in Gs. One G is equal to one times the force of gravity. 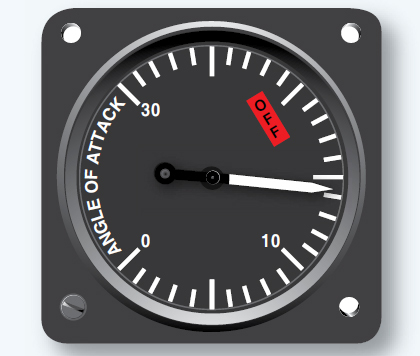 The dial face of an accelerometer is scaled to show positive and negative forces. When an aircraft initiates a rapid climb, positive G force tends to push one back into one’s seat. Initiating a rapid decent causes a force in the opposite direction, resulting in a negative G force. Most accelerometers have three pointers. One is continuously indicating the acceleration force experienced. The other two contain ratcheting devices. The positive G pointer follows the continuous pointer and stay at the location on the dial where the maximum positive force is indicated. The negative G pointer does the same for negative forces experienced. Both max force pointers can be reset with a knob on the instrument face. The accelerometer operates on the principle of inertia. A mass, or weight, inside is free to slide along a shaft in response to the slightest acceleration force. When a maneuver creates an accelerating force, the aircraft and instrument move, but inertia causes the weight to stay at rest in space. 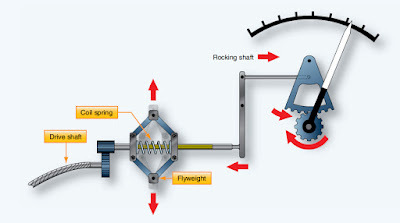 As the shaft slides through the weight, the relative position of the weight on the shaft changes. This position corresponds to the force experienced. Through a series of pulleys, springs, and shafts, the pointers are moved on the dial to indicate the relative strength of the acceleration force. 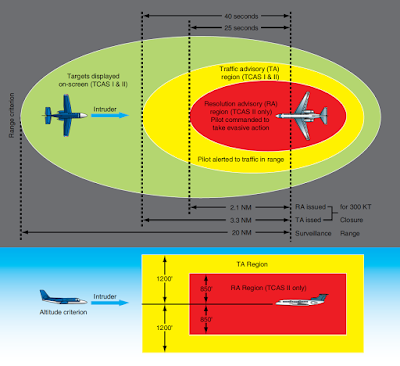 [Figure 9] Forces can act upon an airframe along the three axes of flight. Single and multi-axis accelerometers are available, although most cockpit gauges are of the single-axis type. Inertial reference navigation systems make use of multi-axis accelerometers to continuously, mathematically calculate the location of the aircraft in a three dimensional plane. Electric and digital accelerometers also exist. Solid-state sensors are employed, such as piezoelectric crystalline devices. In these instruments, when an accelerating force is applied, the amount of resistance, current flow, or capacitance changes in direct relationship to the size of the force. Microelectric signals integrate well with digital computers designed to process and display information in the cockpit. An aircraft’s angle of attack (AOA) is the angle formed between the wing cord centerline and the relative wind. At a certain angle, airflow over the wing surfaces is insufficient to create enough lift to keep the aircraft flying, and a stall occurs. An instrument that monitors the AOA allows the pilot to avoid such a condition. The simplest form of AOA indicator is a stall warning device that does not have a gauge located in the cockpit. It uses an aural tone to warn of an impending stall due to an increase in AOA. This is done by placing a reed in a cavity just aft of the leading edge of the wing. The cavity has an open passage to a precise point on the leading edge. 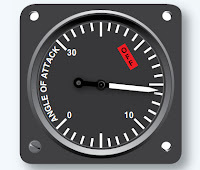 Another common device makes use of an audible tone as the AOA increases to near the point where the aircraft will stall. This stall warning device includes an electric switch that opens and closes a circuit to a warning horn audible in the cockpit. It may also be wired into a warning light circuit. Modern aircraft AOA sensor units send output signals to the ADC. There, the AOA data is used to create an AOA indication, usually on the primary flight display. AOA information can also be integrated with flap and slat position information to better determine the point of stall. Additionally, AOA sensors of the type described are subject to position error since airflow around the alpha vane and slotted probe changes somewhat with airspeed and aircraft attitude. The errors are small, but can be corrected in the ADC. 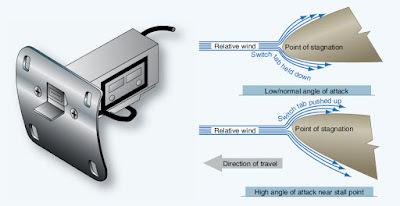 To incorporate a warning of an impending stall, many AOA systems signal a stick shaker motor that literally shakes the control column to warn the pilot as the aircraft approaches a stall condition. Electrical switches are actuated in the AOA indicator at various preset AOA to activate the motor that drives an unbalanced weighted ring, causing the column to shake. 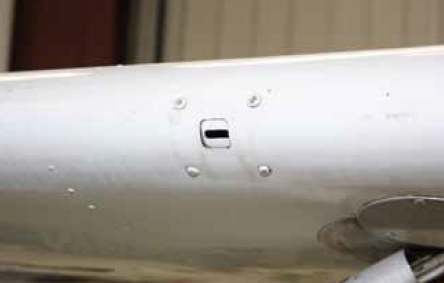 Some systems include a stick pusher actuator that pushes the control yoke forward, lowering the nose of the aircraft when the critical AOA is approached. Regardless of the many existing variations for warning of an impending stall, the AOA system triggers all stall warnings in high performance aircraft.